Can Be Used Inside or Outside! The tiny portable personal air conditioner to cool any area up to 45 sq ft. Works as a humidifier and air purifier too! 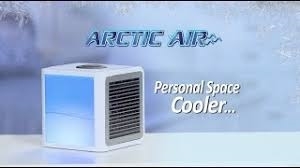 Arctic Air is a tiny portable air conditioner to cool any area up to 45 sq ft. It is super quiet and has a 2 speed fan. It works from water evaporation and is freon free which makes it eco-friendly! Arctic Air works both inside and outside. Cools the air around you, where you need it the most. Acts as a humidifier and an air purifier. 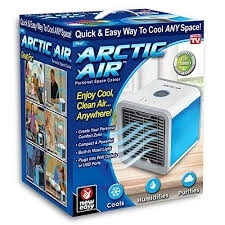 Takes hot and dry air and turns it into cool moist air. With Artic Air's compact design it will fit neatly anywhere- desk, coffee table, nightstand, wherever you need it most! It is super convenient, lightweight, portable, and easy to use! Includes an easy fill water tank for up to 8 hours of use. Pour water into the tank, plug in and enjoy! Easy fill water tank-Lasts up to 8 Hours! Built in LED light-7 different colors with color cycle option!